Do we have a near-perfect lowercase L sighting? This window display found at Jackrabbit on 7th Ave in Park Slope, Brooklyn is composed almost entirely of uppercase letters, and of course, the qualifying lowercase "L" in TRIATHlON. But is it really a lowercase L? Or is it actually an uppercase "I"? 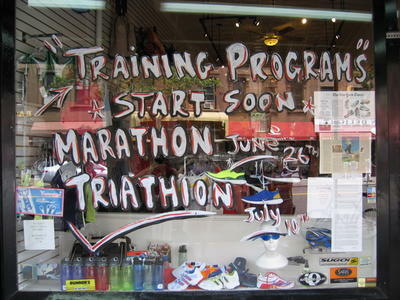 I have found that "triathlon" is sometimes mispronounced and misspelled as "triathion". Or, is "Triathion" the title of a specific triathlon event? Both the "i" in "TRI" and "L" in "ATHlON" are the same size and are shaded identically, so I have my doubts. Also note both a lower and uppercase "i" in the same word, TRAiNING. This could be a result of the author simply forgetting to dot the second "i". But I digress. aha! My pet peeve - inappropriate quotation marks. "Why" do people write like this?! Maybe these training programs are subpar, ... so-called "training programs", accompanied by the hand motion that indicates "quote, end-quote"? Nah.